This is how they turn out if you use the Alternative Preparation Method above. THANK YOU for the lovely recipe. Can i make it with raspberries? i just don’t have the blueberries on hand and i can not wait until tomorrow to try your new recipe. Could I use frozen cranberries? I picked up a bag by mistake and am trying to find a recipe for them! Thank you! Can I use my food processor with the regular blade? I don’t have a dough blade and want to make these right now! ;) I’ve been very successful using the regular blade and making things like pizza dough in the food processor. Thank you! I’ve also been successful using the regular blade even when a dough blade is best – so I say go for it! Oh my goodness, one of my all time favorite treats,,, ai want to make these NOW but don’t have heavy cream. Do you think it would be feasible to substitute whole milk? I don’t have a dough blade for my food processor. Is there another option? Try the regular blade! I sometimes use it as a substitute with no problems. Could you make this in a Vitamix? I don’t have a large food processor? Hi Jenn. We’ve not tried making batters in the Vitamix. Her is a link that might help: https://www.vitamix.com/Discover-Vitamix/What-You-Can-Make. I made them in my Blendtec yesterday and it worked beautifully! Could you use syrup instead of honey? Hi Amanda. You can typically sub maple for honey 1:1. Looks delicious! Any suggestions for a non-dairy substitute for the heavy cream? My daughter has a severe dairy allergy. Looks good! Will pin to try soon! I have used SO Delicious coconut creamer in place of heavy cream in recipes. Not quite as thick – more like half and half, but it works well. Thinking about a non-dairy option using coconut oil instead of butter and regular coconut milk instead of the heavy cream. Might also make a cashew cream instead of the heavy cream. I sub coconut milk for heavy cream all the time, I haven’t had any issues, actually like it better! How would you suggest making this and some of the other recipes Gluten Free for my family. We are trying to eat healthier,however 3 out of 5 of us are Gluten Free. Any suggestions if you don’t have a good processor? Thanks! I don’t have a food processor so I’m planning to cut the butter in with a pastry cutter and then mix the other ingredients in by hand. Try grating your frozen butter,with a box grater, into the dry ingredients and then cutting it in with your pastry blender. Your butter stay colder so you get a better rise from the steam escaping. It also takes a fraction of the time! Do the blueberries get grinded up or bleed into dough causing it to be blue/ purple? Hi Shannon. If you use frozen blueberries, they will not bleed much. I used dried blueberries and they stayed intact. I just made this recipe according to the instructions. The frozen blueberries got pulverized. I suggest folding in the blueberries by hand after the wet ingredients are incorporated. Or perhaps move to a mixing bowl after incorporating the butter. Stir in the blueberries, then add the wet ingredients. Yes and amen. I agree wholeheartedly with this. Wondering if I can do this in a Vitamix? Hello. We’ve not tried making this in a Vitamix. This might help: https://www.vitamix.com/Discover-Vitamix/What-You-Can-Make. My Blendtec worked great, so I’m sure your Vitamix will! Is it possible to use lemon zest instead of the orange? Excited to try to this recipe for my daughters! Hi Jennifer. Yes, that should be fine. Just made these and they were delicious! Only problem was the dough turned blue. I’m thinking maybe mix in the blueberries by hand just before rolling out the dough? Hi Darci. If you add them fully frozen, they tend to bleed a lot less. Just made them, delicious! I used a regular food processor blade and whole milk and they turned out great! Thanks! can you substitute raspberries instead? or once you freeze raspberries do you lose all the nutrients? Can you sub heavy cream for another type of milk? I made these for breakfast this morning. They were really good! I made them by hand and just used a pastry cutter to mix in the butter. We topped them with a drizzle of honey. A perfect breakfast! I loved the subtle taste of the orange. Can you use the blendtec or a mixer if you don’t have a food processor? Hi I live in Australia. I am unsure what a stick of butter is in weight terms ( I have a thermomix) is it 250 grams? Hi Melinda. I am an Aussie living in Canada, so can tell you that a stick of butter is equivalent to 125 grams. Happy cooking! can whole milk or 2% milk be substituted for the heavy cream? Hi Tabitha. Other readers have subbed at least part of the cream with whole milk. Hi Melinda, I live in Australia. could you tell me if whole-wheat flour is the same as wholemeal flour here in Aussie. :) Plain or you will end up with an overly leavened scone. I just made these and the blueberries (frozen) got completely pulverized. Is that the intent? Did you use the plastic dough blade? If you used the regular metal blade it would have definitely chopped the blueberries up, but the dough blade mixes without chopping. Just a thought. That happened to me as well. I used a plastic dough blade, but the whole thing turned into a purple gooey mess. The dough never formed a ball even when I tried by hand. I don’t know what went wrong? Hi Cindy. I had the same exact problem. I followed the recipe exactly so I don’t know what went wrong. Mine was the same. I ended up adding an extra 1/2 cup of flour or so at the end and kneaded that in by hand. They turned out good as far as the flavor and texture. But I think I will try adding the blueberries in at the end next time. Yeah. I added extra flour too. I might try them again and add the blueberries at the end but overall this recipe is fairly disappointing. I folded the blueberries in at the end just before shaping into a circle. Does anyone have the calorie count or fats etc. per each scone? 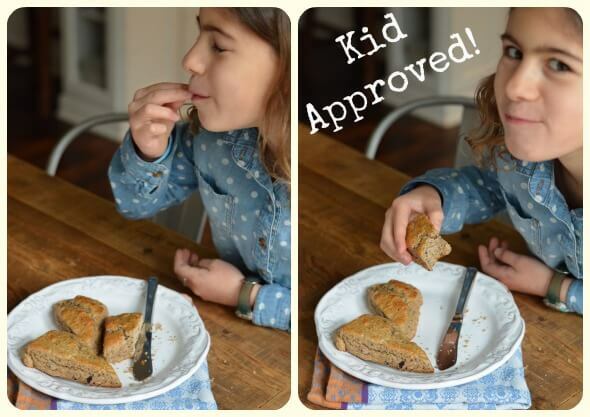 Think you could make an equal substitution with spelt flour? Hi there. Yes, spelt should work well, too. Yum! Any idea on calories per serving? Hi Amy. We don’t provide calorie information. This post helps explain: https://www.100daysofrealfood.com/2013/01/04/healthy-eating-defined/. I just made these and I’m so bummed! I tried using my mixer with a dough hook, my BlendTec, and my pastry cutter. They are like gray biscuits. I don’t taste any blueberry which is crazy for what color they are. My blueberries were frozen. I did the Spelt Pumpkin Muffins today and LOVED them. Oh well. Just made the scones. They taste like scones, have a nice flavor, but they are puffy like cake. Is that due to the eggs? I’ve never made scones with eggs, usually just butter and cream. I’ve also never made scones with the food processor. My scones are also a dark blue (started with frozen blueberries). I used whole sprouted spelt flour. Taste is good, just a strange consistency. For as puffy like cake as they are I think they need to be sweeter. The batter was a little wetter than I had expected. So yeah, one other thing I did was substitute baking soda or baking powder. 1 t baking soda. Maybe too much? Hi Joelle. My dough was way too wet too. I couldn’t even shape mine and had to throw it out. I had wondered the same thing about the eggs. The scone recipes I usually use never call for eggs either so I hear ya. Baking powder and baking soda are not interchangeable, that’s probably what the problem was. Interesting that they are not interchangeable. I was doing some reading about it. My kids actually liked them cake like. The taste is good. I’ll make them again, but maybe with baking powder this time. Living in the UK, I’m wondering what 1 ‘stick’ of butter is. How many grams would this be please? These were a hit this morning! I don’t have a food processor, so I had to mix by hand. They came out soft, but delicious. I did have to make one minor change. I had no cream because I had whipped it up for a dessert. I used the whipped cream instead, so it had vanilla and maple syrup added. I love scones right out of the oven! Can’t wait to try this recipe! Great idea on the kiddos lunches! 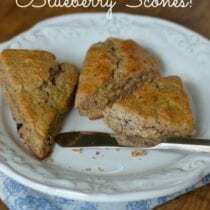 These scones are delicious and easy to make. I’m already making my second batch because the first is already gone. I did something really stupid with these. I put them on a flat cookie sheet, and the butter melted and ran down to the bottom of the oven and almost caused a grease fire! So make sure you use a rimmed baking pan. Despite that, they were absolutely delicious! My 18-month-old daughter loved them and made lots of yummy noises. Will definitely be making these again. I tried with my food processor with regular blades and it was way too wet. Tried adding a bit more flour and mixing by hand but no luck. :( I think the regular blades pulverized the blueberries, as only a couple were still intact.. Any ideas? Ready to put in the oven. The dough is an ugly gray color. I’m thinking next time the frozen blueberries should go in at the end? Mine too & I followed the recipe exactly…thinking the frozen blueberries need to go in at the end. Amazing! Mine turned out purple but delicious. The orange overpowered the blueberry flavor but the taste is incredible. I followed the recipe exactly and had to throw out the dough. It turned into a blue, wet mess. I was so disappointed. I think if I tried again I’d increase the flour and not mix in the blueberries until the end. I agree with previous comments, definitely more cake like. Sort of like a cross between a scone and a muffin. Still, quite delicious! I made mine with sour cherries (which I folded into the dough before rolling/shaping), omitted the orange zest and topped with a thin lemon glaze(organic powdered sugar and lemon juice). Can’t wait to try the recipe with blackberries. Mystery solved! I tried to make them yesterday and it was a blue gooey mess. Had to throw out the dough. Two modifications and perfection today ! Delicious! First, you MUST use whole wheat flour. I used white whole wheat yesterday and it didn’t absorb all the liquid…thus the gooey mess. Secondly, I stirred in blueberries by hand at the end….didn’t risk turning the whole thing blue! Yum!! This may have already been asked but what if you don’t have a dough blade? This recipe was a total fail for me and the first bad outcome from this website :( I used my kitchen aid mixer using the dough hook. First the tablespoon sized butter was too big and never broke up in my mixer. Then, I added the blueberries straight from the freezer and figured maybe it would work better since I was using a mixer and not the food processor but I was wrong. The dough was extremely sticky, blue/gray, and I could barely get it out of the bowl. I coated both my cutting board and the top of the dough with flour just so I could pat it out without it sticking to everything. They baked up nicely but taste very bland. I have been following this blog and have been eating roughly a 70-80% of a real food diet for 2 years now so I am used to things having just a touch of sweetness but this tasted like plain flour. Lisa, have you ever tried maple syrup instead of honey? Hi Kristin. We have used them interchangeably but not in this recipe. Maple does change the flavor somewhat. This was a total fail for me. I also was left with a blue sticky mess. I couldn’t seem to add enough extra flour to hold it together. I’m so bummed. I was looking forward to these! I love these!! My blueberries did break down and make the dough grayish purple, and the dough was pretty sticky but I didn’t know any better so I went ahead and baked them! Sooo good! I added fresh rosemary to my dough which was definitely a good choice! Will definitely be making these again! I wish I would’ve read the reviews on this one first. Like other reviewers, mine turned out to be a purple/gray gooey mess that I had to throw away. I used white whole wheat. I will try these again soon and will use whole wheat not white whole wheat and will add the blueberries at the very end. Mine were also blue, but who cares! I had to cook them for about 23 minutes, but I think I made them a little thicker than required. Overall, great taste, just enough flavor to not be boring and a good balance with my morning coffee. My 2 year old loves them and my very picky 6 year old at least tasted it, but no go this morning. Tastes like flour. That’s about it. Is There a Substitute for Heavy Cream in this recipe? Are you asking about a non-dairy sub? Should have read the reviews! My dough too turned into a grey sticky mess. I wasn’t about to throw it all away! So I incorporated A LOT more flour by hand and made it work. However, they ended up VERY bland. I know scones are supposed to be less sweet, but these need a little sometime more…I’d say either more honey, zest, or at the very least, a spread of some sort when serving (butter, honey, fruit spread, etc). Next time I will stir the blueberries in by hand at the end to avoid the grey stickiness. To make this recipe a 10 try drizzling them with lemon glaze. Just add freshly squeezed lemon juice to organic powdered sugar until the desired consistency is reached, I make mine fairly thin. Drizzle the glaze onto cooled scones. Also, try folding the frozen berries into the dough by hand. I thought these were great! I didn’t think they were bland at all. If anything, I was suprised by the level of sweetness with no added sugar. The are amazing. I had no problem with the color of the dough. It happens….and it doesn’t change the taste. I love these, my family loves these. I can not make enough. Lol. If you gently fold the frozen berries by hand into the dough while making the the round circle of dough, you end up with dough perfectly studded with berries. (It doesn’t change the color of the dough). Though I’ve only tried it with blackberries and sour cherries. Is there a way to make these if you don’t have a food processor with the dough blade? Hi Melissa. You can just make it by hand. This might help guide you: http://allrecipes.com/video/337/how-to-make-scones/detail.aspx. Just made these for the first time…..didn’t mind the blue color, but after having read all of the reviews, I still don’t know how to “fix” the stickiness of the dough! I followed recipe to a T, but the stickiness was a bit of a problem. Turned out okay, but definitely will make a glaze for them next time. These are great!!! I’ve made them many times and my family loves them. I didn’t have a food processor when I first made them so I cut the butter into thin slabs and used a fork to break them into pea sized pieces. The blueberries were my last ingredient (frozen, wymann’s brand). Yes the dough turned blue, but I think it makes them pretty :-) After reading the reviews I think I’ll stick to my fork method instead of using my processor. I also love that it’s a whole wheat recipe. To avoid coloring the dough with the blueberries, use dried blueberries instead. This way you have the flavor and nutritional value of the blueberries without creating a “mess” of the dough. These are wonderful! So, I tried an experiment to lighten these up just a bit and took out the heavy cream and instead juiced the orange and made up the rest of the 1/2 cup with buttermilk. I also used dried cranberries instead of the blueberries. They are wonderful, too! I love a recipe that has some flexibility to it! These are amazing! I used 1 cup whole wheat flour and 1 cup whole wheat pastry flour. I also used some of the juice from the orange and cut back the heavy cream (I also add lemon juice to your raspberry lemon muffins). I think this helps them become moist. I used your frosting recipe of powdered sugar, heavy cream and added lemon. Used this to add a nice light glaze. Delicious! Hi. You’ve probably gotten to the store by now. :) I use real coconut milk/cream. We just made these these! However, my kids are not fans of blueberries, so we made them with chocolate chips. And since I knew they would like them a little on the sweeter side, I added an extra tablespoon of honey, removed a tablespoon of the heavy cream to keep the liquid to the same measurements. They came out Absolutely delicious. I just used extra flour to help with the stickiness of that though. 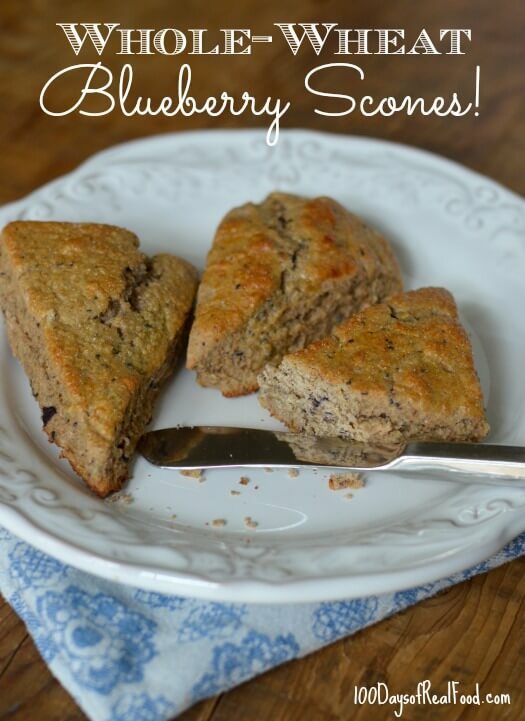 Wasn’t a problem for me.so excited to find a scone recipe that doesn’t use refined sugar! I will use these as a base for many other varieties of scones. Can fresh blueberries be used instead of frozen? Hi there. We’ve only used frozen. Let us know if you give fresh a try. Fresh works just fine. I also had to add more flour. They are delicious with a glaze on them. My 1-year-old thinks they’re cookies. “Cooookie. Cooookie. Cooookie”. Win! The picture under the recipe shows whole blueberries on top. It says this is an alternative method above but I don’t see any alternative methods mentioned anywhere. 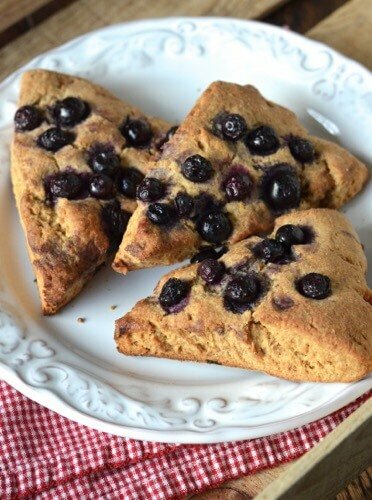 I want to make these with whole blueberries instead of pulsing them into it. How are the made this way? You can either fold them into the dough by hand at the end or press them into the top of the triangles before baking. I hope that helps!